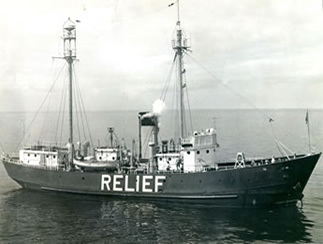 National Park Service / Lightships in the U.S.
Nantucket / LV-112, in service as USCG First District Relief lightship (1958-1960). LV-112, served as a Relief vessel on Boston, Portland, Pollack Rip, Stonehorse, Cross Rip, Buzzards Bay and Brenton Reef lightship stations. Commencing in April 1960, major modifications, modernization and refit was carried out at the Coast Guard Yard, Curtis Bay, MD. LV-112, was then reassigned to Nantucket Shoals until 1975.